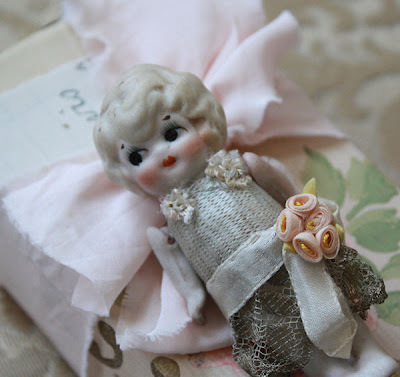 I found this sweet little jointed bisque doll in an antique store last week (the same one where I found the pink prize ribbons in my last post). I'm such a sucker for these sweet little dolls. Only problem was, she needed clothes. 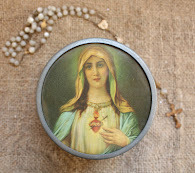 She had just her little silvery top, but no skirt. What's a girl to do? I had such fun going through my stash and finding a beautiful old piece of 1920's silver metallic lace for a skirt, old silk ribbon for her sash, and a sweet little ribbonwork posy for embellishment. I was really tickled with how she turned out. I just enjoy looking at her with her sweet little face and now, jaunty flapper attire. Isn't it funny how sometimes the simplest things give us the most pleasure? 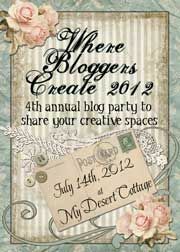 Just a quick post to say I'm thinking of you all out there in Blogland. 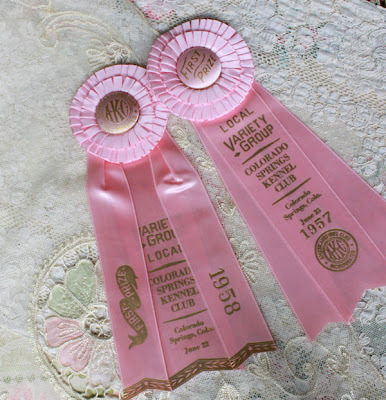 I was tickled "pink" this week when I stopped by one of my favorite antique shops and found these two pink first prize ribbons from the late 1950's. 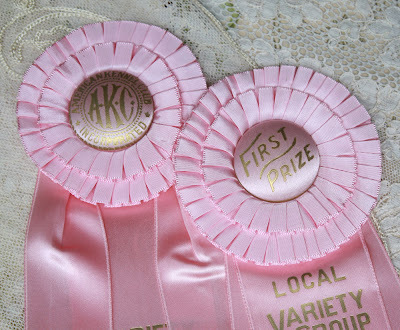 Not only are they pink and gold and in pristine condition, but they are from my town's kennel club. Local history buffs rejoice! I needed them like a hole in my head, but who could resist these beauties???? Obviously, not little moi (wink, wink). Must admit, I'm not totally sure what I'm going to do with them yet, but for now, I just love looking at them and imagining who was so proud of these that they kept them safe and secure and perfect for over 50 years. I guess its up to me to uphold the tradition and keep these safe and secure and perfect until the next person's turn to love on them! 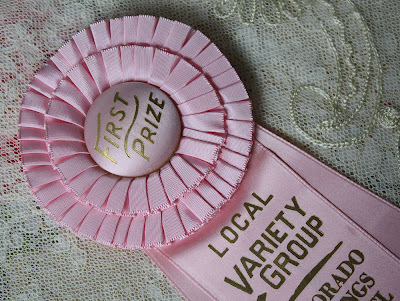 Have a wonderful Pink Saturday and do pop over to Bev's at How Sweet the Sound, our hostess for this fun event and see the other Pink Saturday participants. Wow! I never cease to be amazed at how quickly the days and the weeks fly by. I didn't mean to take a vacation from blogging, but I certainly did. Hmmmmmm, a full life? Yes, I suppose. Too many tasks, too little time? Most definitely. Baseball 6 nights a week? Yup, that too. HAPPY PINK SATURDAY! These sweet little pink shrub roses are my first yard bouquet of the year. They faithfully bloom with their unabashed lipstick pink blooms every year, sometimes two different times, and they provide the most wonderful rose smell I have ever smelled. 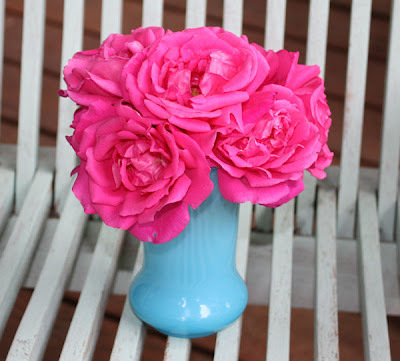 I love the way they look in one of my favorite little vintage vases that is a beautiful opaque aqua blue. I hope you are all having a lovely summer. We are still waiting (less than patiently) for summer here in Colorado. Cool and rainy has been the forecast de jour for about a month. The plants love it. Although we need the moisture, I'm sure ready for some swimming pool weather! 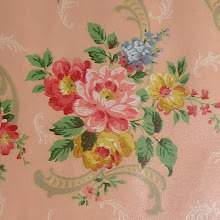 While you are out blog hopping, stop by Bev's at How Sweet the Sound who is our hostess for Pink Saturday, and check out the plethora of pink posts out in Blogland. You'll be glad you did!